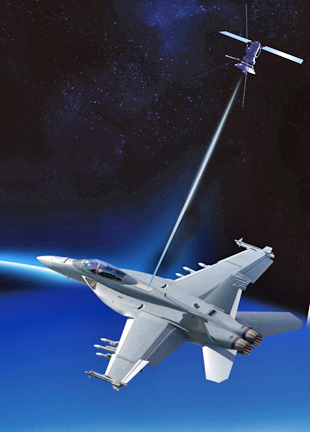 Israel Aerospace Industries (IAI) has received their first order for the company's SATCOM terminal with a conformal electronic-steered antenna for fighter jets. ELTA's ELK-1882T SATCOM network system will be installed for the first time on tens of very advanced Western fighters, with first deliveries planned for 2021. This network system is the latest technology developed by ELTA Systems Ltd., a group and subsidiary of IAI (IAI/ELTA). IAI/ELTA's SATCOM solutions will be displayed at SMi's MilSatCom Show in London, UK, on November 7-9, 2017. The customer has selected the innovative ELK-1882T Ku-band phased array SATCOM network for the product's ease of installation and integration, which boasts minimal impact on aircraft performance due to the conformal installation. This conformal flush installation generates negligible drag, as opposed to conventional high profile SATCOM dish antennas. In addition, the new system has no moving parts, which greatly enhances reliability and robustness, especially on board modern high maneuvering fighters. The onboard system (terminal) includes a conformal phased antenna installed on the jet's fuselage, comprising the transceiver, modem and High Power Amplifier (HPA) in a single LRU, with an IP LAN connection to the aircraft avionics. Nissim Hadas, IAI Executive VP & ELTA President, noted that this is a strategic and important cooperation for ELTA's SATCOM products line with a leading aircraft manufacturer and prestigious customer — this significant achievement is only the first milestone in positioning ELTA as a leader in electronic steering technology for aircraft communication solutions.